Ephemera Press's East Village Map was used as endpapers for a book about artist David Wojnarowicz's years on the Lower East Side published by Semiotext(e). 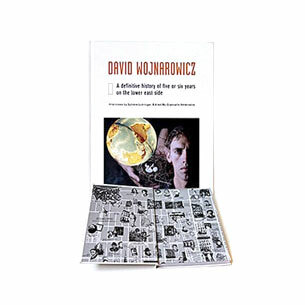 James Romberger and Marguerite Van Cook, the illustrators of the map, were friends of Wojnarowicz and provided the art for his posthumous comic book autobiography Seven Miles a Second. 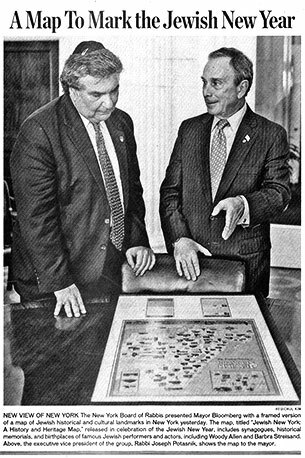 Mayor Michael Bloomberg and Rabbi Joseph Potasnik admire Ephemera Press's Jewish New York History and Heritage Map. The map was commissioned by the New York City Board of Rabbis to celebrate the 350th anniversary of the arrival of the first Jews in New York. 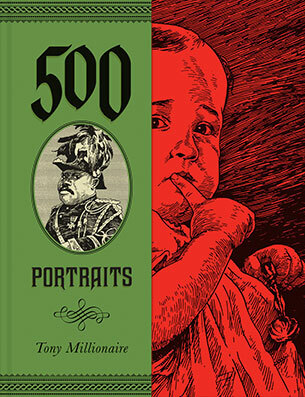 Congratulations to Tony Millionaire for his new book 500 Portraits published by Fantagraphics (2011). Many of these portraits were originally created for Ephemera Press's Queens Jazz Trail Map, Harlem Renaissance Map, and History Map of Lower Manhattan. That's Marcus Garvey from our Harlem map on the cover of Tony's book. "After Seven Years of Disputation, a Map Makes Its Debut"
"Jazz's History Is Living in Queens..."
"Maps of The Queens Jazz Trail, The Harlem Renaissance, and The East Village. Published by Ephemera Press, Brooklyn, NY." "City Lore; Every Map Is a Picture, Every Picture Tells a Story"
"Miller's Ephemera Press Comic Style Maps"
Some maps are rather boring. Sure most have the important details - such as city names and roads and all the important stuff you need to get from one place to another. But not a lot have gusto or that certain something that makes it much more than just a map, it makes it fun. Marc Miller's Ephemera Press has created a whole new series of maps and postcards based on historical locals in New York. Instead of just making straightforward maps, they've jazzed them up a little by having the maps illustrated by some fantastic artists including Maakies creator Tony Millionaire and Seven Miles A Second's James Romberger and Marguerite Van Cook. Miller told us how he came up with the idea to combine art and maps. "I’m a curator and a few years ago I was hired by an art space in Queens New York to create an exhibition about the history of jazz in Queens," he began. "I kept thinking about this great nightclub map of Harlem that was done in 1931 by E. Simms Campbell, a black cartoonist who was then doing cartoons about Harlem but later became famous for his Sheik and Harem cartoons in Esquire. It seemed obvious that a pictorial map was the best way to show how many major jazz musicians lived in Queens. When I suggested it to the director of Flushing Town Hall, she quickly agreed and the Queens Jazz Trail map was born. The East Village was my old stomping ground. Years ago (1978) I organized the world’s first Punk Art show working with John Holmstrom and the other cartoonists from Punk Magazine. I met Keith Haring when I was teaching at School of Visual Arts and he was a student. Harlem was also a natural for me. My most ambitious curatorial project was an exhibition on the jazz musician Louis Armstrong that traveled around the country under the sponsorship of the Smithsonian. I had the original drawing of E. Simms Campbell’s Nightclub Map of Harlem in that exhibition." "Since Campbell was a cartoonist I always pictured the map in a cartoon style," continued Miller. "Cartoons communicate easily with all sorts of people and are a great educational device. Fate also intervened. Around that time I saw a poster with a cartoon map advertising a block party sponsored by the Brooklyn Brewery in Williamsburg. That’s how I met Tony Millionaire who illustrated the poster and turned out to be the perfect artist for these types of maps. He’s great with architecture, great with portraits and most important he’s a workaholic." Miller continued, "Tony loves old maps and old architecture. Long ago, when he was a starving artist he made money by doing drawings of fancy houses in the ritzy parts of Long Island. He also admires R. Crumb and knew of Crumb’s drawings of Jazz and Blues musicians. So he agreed right away to do the Queens Jazz Trail Map. I think he agreed to do the Harlem Map because after doing one map, we both knew we could make a really, really great map the second time. It also didn’t hurt that I offered him a lot more money. When I decided to do a map of the East Village, I knew immediately that I wanted it to be illustrated by James Romberger and Marguerite Van Cook. The comic book they did with the late East Village artist David Wojnarowicz, Seven Miles A Second, is a classic. All of James’ art deals with the East Village and he even has an East Village painting in the collection of the Metropolitan Museum of Art. The project was so right for James and Marguerite, they couldn’t say no. We think of the maps as works of art and we consciously try to hire artists who have their own distinctive drawing style. Tony Millionaire, James Romberger and Marguerite Van Cook all fall into that category. I want to also give credit to our designer Kevin Hein who was recommended by Tony. He came on board after the Queens map and devised the method where the images are collaged over the map." Getting artist to agree to illustrate the maps was the easy part. Miller still had a long road ahead of him. One filled with meticulous details. "The research is really tedious," he admitted. "An archivist at the musician’s union in New York helped us track down addresses for the old jazz musicians in Queens. The information on the East Village is more recent and it was gathered mostly through word of mouth. In a number of instances people still live at the addresses listed on the map. After we decide what’s on the map we need source material for the portraits and then we have to drive around and get photographs of the buildings. For the artists it’s a total grind, each map includes close to 150 drawings." And each map takes around six months to create. However all the work has been worth it according to Miller. He's pleased with the way the maps have been received. "The reception has been truly amazing," he enthused. "The Queens Jazz Trail map has actually inspired a bus tour that won an award given by British Travel writers for the best new American tourist initiative. The Harlem Map is now in schools and libraries around the country; we have also been able to license its use for a variety of functions. The East Village map is a real cult item; its in clubs, bars, video stores. Most of the visitors to our website come from links posted at EV related sites like CBGB, the Fillmore East, and especially sites devoted to the Ramones. Since the maps were written up in the New York Times, we are also regularly approached by people that want to commission similar maps." Maps aren't the only things Ephemera are introducing to the masses. Miller's also getting ready to release a series of postcards. He told us why he wanted to branch out. "Years ago I got a collection of postcards from the 1960s showing the homes of celebrities in Las Vegas," Miller began. "Since people regularly compare our maps to the maps of movie star’s homes sold in Hollywood, I thought why not use the images on our maps to make postcards similar to the Las Vegas set. In Las Vegas they got the home of Liberace; in New York we have the apartment of Joey Ramone. Miller also told us about some upcoming releases. "There are a zillion potential subjects," he said of maps and postcards. "Right now we’re in the initial stages of developing a Hip Hop New York map. Hopefully we can find a top graffiti based artist to illustrate it. We also hope to do maps of other cities. For a long time we’ve been planning a music map of New Orleans." If you're interested in getting your hands on these cool creations Miller told us how you can get your own copies. "They’re sold all over New York. Forbidden Planet and Jim Hanley’s Universe are two comic book outlets that handle them. If you’re not in the city, the best place to get them is at our website: www.ephemerapress.com." "Paperview: Maps of Our Heart"
What do you get when an obsessive historian of New York's cultural margins teams up with artists of a similar bent? The result is CultureMaps - illustrated masterpieces depicting the city's haunted histories and subcultural lore. Art historian and curator Marc Miller observed, while working on a panoramic model city at the Queens Museum, how "a map is like a magnet that just pulls people in." So Miller teamed up with illustrators Tony Millionaire and James Romberger and Marguerite Van Cooke to create these deftly compacted portraits of the overlapping social and creative lineages that make up the city's neighborhoods...Appreciating maps for their capacity to "condense information clearly," Miller regrets he could not include more. "History," he says, "is cruel." "Artnet News: Romberger Maps the East Village"
For lovers both of pictorial maps and of New York City, there are two new maps from Ephemera Press. The Harlem Renaissance graphically identifies the homes, clubs, and sites associated with noted writers, artists, and other cultural figures in Harlem. The Queens Jazz Trail illustrates the neighborhoods and sites of musicians in the borough of Queens, the "home of jazz."